Designed by Paul B. Clayton, Johnie’s Broiler opened in 1958 as Harvey’s Broiler. It was a superb example of Googie style architecture, with a lighted boomerang-shaped drive-in canopy that could accommodate 100 cars, and flamboyant signage visible to drivers traveling along Firestone Boulevard. In 2001, the coffee shop/car hop closed down and proceeded to become a used car lot a year later. 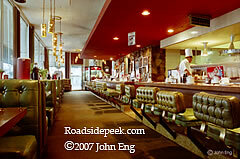 When the changeover occurred, much of the interior of Johnie’s was destroyed. But the building, carhop area, and signage remained. 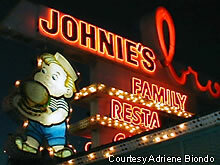 After tremendous support from the Friends of Johnie’s and the Los Angeles Conservancy’s Modern Committee, the California Historic Resources Commission voted unanimously to include Johnie’s Broiler in the Register of Historic Places. Placement is contingent on the property owner’s support and agreement, which was not received from Smyrniotis. According to the January 8, 2007 issue of the Long Beach Press-Telegram, Smyrniotis’ lessee filed a request in October 2006 to tear down the building with plans for a small retail strip center. The request was denied due to deficiencies, including the lack of an environmental impact report. 2007 began on a sour note. 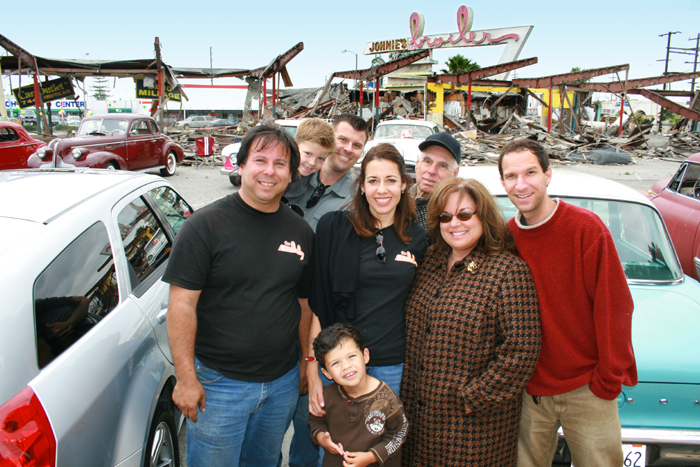 On January 7, 2007, a couple of bulldozers suddenly appeared on site and started razing the carhop area and structure. By the time concerned citizens contacted the authorities, it was too late. The carhop and a good portion of the restaurant area had already been demolished. The police stopped the demolition due to lack of permit. For those who stood by the remains of Johnie’s the evening of January 7, 2007, the smell of the demo was undeniable and unforgettable. The sign still stood, strong as ever as it faced Firestone Boulevard defiantly. But the aura of sadness permeated the air, as residents, fans of Johnie’s, and onlookers stared at the what was left, trying to understand and determine whether this was now farewell. Many current and former residents remember both Harvey’s and Johnie’s Broiler fondly. One patron remembers cruising Harvey’s in 1960-1963 after graduating from Lynwood High in ’63 and tasting the hot chocolate on a cold night and even the gravy fries. She remembers doing “the cruise” which was a roundabout from Long Beach Blvd and Compton Blvd, taking them from Jerry’s BBQ north to South Gate “where we would end up at the donut shop on Tweedy Blvd.” They would then make their way to A&W at Tweedy and Atlantic. Then everybody headed for Harvey’s. 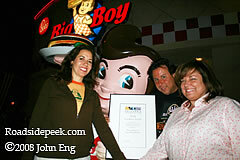 04.10.2008 – The news is official that Johnie’s Broiler in Downey will now be replaced by Bob’s Big Boy. A long term lease has been agreed upon between Bob’s Big Boy and Johnie’s owner Smyrniotis, 15 months after Johnie’s was partially demolished illegally by a lessee. A historic preservation consultant has been hired to determine what pieces of Johnie’s are still salvageable, including the fat boy sign. Coalition members (l-r) Kevin Preciado, George Redfox and son Jake, Analisa Ridenour and son Holden, John Biondo, Adriene Biondo, and Marcello Vavala. Photo by John Eng. Good news and many thanks from all Harvey’s and Johnie’s Broiler fans to those who helped make this happen and keep the spirit of Johnie’s alive, including the Friends of Johnie’s, the Coalition to Rebuild Harvey’s, and the Modern Committee of the Los Angeles Conservancy. Many thanks to Adriene Biondo for the alert to this update as well as her tireless efforts working with the local preservation groups, city officials, and the public towards this successful outcome. 06.25.09: Downey, CA: Bob has arrived! 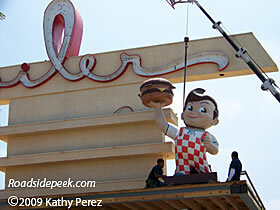 The 12 foot vintage Bob is hoisted up on the roof of the Broiler as the 3rd generation takes shape. 05.05.08: Torrance, CA – Congratulations to Adriene Biondo, Analisa, and Kevin Preciado for winning the California Preservation Foundation President’s Award at the foundation’s conference in Napa in late April for their tireless work on Johnie’s Broiler. Well deserved! 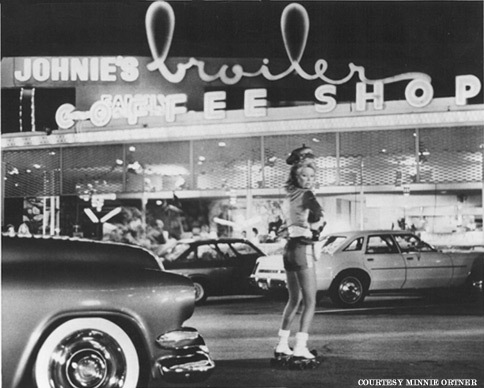 This entry was posted in Architecture, CA, Historic Preservation and tagged CA, Downey, Googie Style, Harvey's Broiler, Johnie's Broiler. Bookmark the permalink. Great article about what seems to be a fascinating building with lots of history. Love that sign! So glad that at least part of it was able to be preserved. Luckily we were able to rebuild it as a Bob’ Big Boy Broiler. We included elements of all 3 iconic businesses to make it The Broiler and it’s been back with us for nearly 7 years as a Bob’s when many other places have come and gone. Read all that you can about it, Adriene Biondo, Analisa Ridenour, of course Jim Louder (Bob’s Proprietor), The City of Downey and myself – Kevin Preciado worked very hard on this project and bringing this great place back to the people for all to enjoy and of course patronize as it is after all a running business, so please stop in if you’re in the area and grab a Big Boy, Hot Fudge Cake and Malt or Shake and take in all of the hard word that was done to make this once partially demolished restaurant a great place once again.